Redcliffe was once a small seaside retreat 40 km north of Brisbane. When the Hornibrook and Houghton Highways linked Brighton, an outer Brisbane suburb, to the Redcliffe peninsula, then Redcliffe became much more accessible and grew as part of Brisbane's suburban sprawl. The area was first visited by Matthew Flinders in July 1799. He spent 15 days in Moreton Bay, landed and named Red Cliff Point on 17 July. It was not until 1823 that John Oxley, on instructions from Governor Brisbane to find a suitable place for a northern convict outpost, visited Moreton Bay. It was on Oxley's recommendation that Red Cliff Point was chosen for the penal colony. On 24 September that same year the brig Amity brought officials, soldiers, their wives and children, and 29 convicts to Redcliffe. Three children, the first European children born in Queensland, were born in September and November 1824. The settlement progressed well with temporary huts being built for the soldiers, their wives and children, and the convicts. Gardens were dug and vegetables planted. However the death of Felix O'Neill in March 1825 combined with Aboriginal attacks, hordes of mosquitoes and the lack of safe anchorage facilities, led to the settlement being moved in the middle of 1825 from Redcliffe to the banks of the Brisbane River. A few buildings were left standing at Redcliffe and it is claimed that the local Aborigines, with a rather nice sense of irony, called the houses 'oompie bong' meaning 'dead house'. The name stuck and the Anglicised 'humpybong' was applied to the whole of the Redcliffe Peninsula. During the short life of the convict settlement a store, prisoners barracks, a kitchen, well, whipping post (no good convict settlement could be without one), gaol, guard room, brick kiln, soldiers barracks and commandant's house were all constructed. 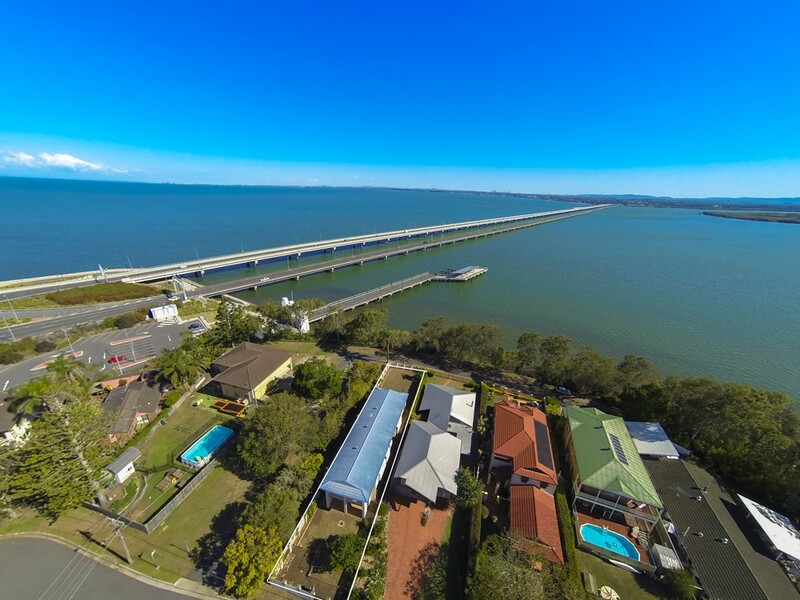 The stores and the main landing place were located where the Redcliffe Jetty now juts out into Moreton Bay. More details on the early history are contained in the excellent Redcliffe 1824 and Matthew Flinders in Moreton Bay 1799 both of which are available from the Redcliffe Museum. It was not until the early 1860s that the Redcliffe area was opened up for agricultural purposes. Over the next 70 years it grew slowly. The first school was opened in 1876, hotels were built at Woody Point, Redcliffe and Scarborough in the 1880s, the Woody Point Jetty was completed in 1881, the Redcliffe jetty and Post Office were built in 1885 and Garnet & Natone's steamers from Brisbane started a regular service in the 1880s. In 1908 a publication the Souvenir of Humpybong (it can be obtained from the Redcliffe Historical Society) sang the praises of the peninsula: 'The exhilarating climatic conditions of Redcliffe, Woody Point and Scarborough cannot be too highly praised. They are little paradises set in the silver sea, where you can breathe God's glorious oxygen and thrill with delight to be alive. Redcliffe remained an isolated retreat until 1935 when one of the engineering marvels of Queensland, the Hornibrook Highway, was built. The Hornibrook Highway stretches 2.74 km across the mouth of the Pine River and Hay's Inlet and is the longest road bridge in Australia. It linked Redcliffe to Brisbane and, particularly after World War II, was instrumental in the rapid growth of the Redcliffe area. By 1969 some 20 300 vehicles were using the bridge every day and with a single lane either way just one breakdown caused chaos. Consequently in 1974 it was decided to build a second bridge. It was completed in 1979. It has 99 spans and a total of 400 beams. The longest pile was driven 38 metres before reaching sandstone. Today Redcliffe is one of the popular outer city beachside retreats for Brisbane residents. It is pleasant and thriving centre which officially became a city in 1959.